What Factors Influence Website Value? Guest Post: Which Factors Influence Website Value? Today’s blog post is by Mark Collier of DropMining.com. I love his insights into Flippa’s sales data, and hope you appreciate it as well! 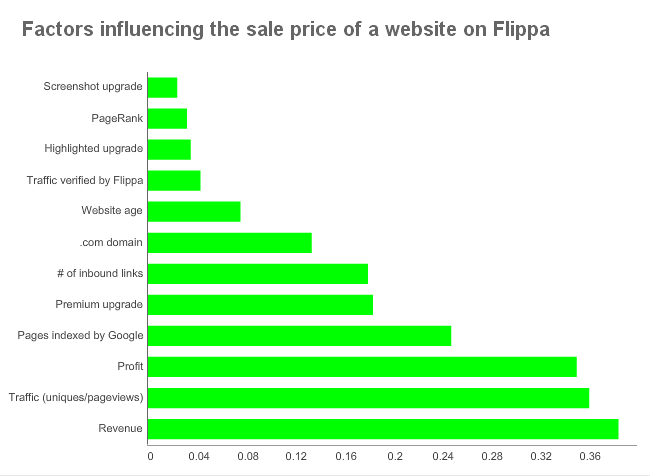 Over the last several months I’ve been busy annoying the Flippa tech team gathering data on over 6,500 Flippa sales as part of a comprehensive study to determine what influences the value of a website and it’s sale price on Flippa. My core goal was to develop a reliable website valuation model but additionally I wanted to delve into the data and answer some of the questions you might have about website flipping and selling on Flippa in general. Note: this study was independent of Flippa, in fact they weren’t even aware I was conducting it and thus all findings are my own. I looked at 52 potential influencers of a website’s sale price; mostly the data Flippa provides with their listings as well as some of my own. I used a statistical analysis technique known as multiple linear regression to determine which of the 52 metrics of a website’s value are statistically significant influencers and which aren’t important. I’ve summarized the major findings from the study below, you can find the full version on my blog. It’s pretty easy to buy into a lot of the hype regarding what you can do to a website to make it more valuable. But a lot of it is just that – hype. Only 18 of the 52 metrics often used to measure a website’s value are actually statistically significant influencers. That means that if you spend time and money improving on the other 34 metrics you will likely see no increase in your listing’s sale price. Take a look at the below graph which shows the importance of the most influential metrics. Importance is measured through a combination of both the amount a one unit increase will cause the sale price to rise by and the how what scale the metric can be increased to. For example many Flippa upgrades cause a pretty large increase in sale price, but with many of them you can only buy them once thus their impact on sale price per unit increase might be quite large but the data only shows that metric as having a range of did or didn’t buy. But while a one dollar increase in monthly profit might not have a massive increase in the sale price, it’s one of the most important metrics because profit can be virtually infinite. Revenue, profit and traffic are clearly the most important factors influencing the sale price. Holding everything else constant each dollar increase in monthly revenue and profit will yield a $2 and $3.50 increase in the site’s value respectively. In practice often two metrics work together, for example a $1 increase in revenue may also lead to a $0.75 increase in net monthly profit thus having a double effect. Or the number of inbound links to a website may increase the site’s traffic, which increases revenue which in turn increases profit, having a quadruple effect. If you’re flipping a website, your sole focus should be to increase traffic, revenue and profits in a sustainable manner but with immediate effects. Any actions that fulfill these criteria will have the maximum positive impact on your listing’s sale price. I get really excited when data can find clear cut answers to people’s questions. Taking advantage of Flippa’s feature allowing you to directly link your Google Analytics account to your Flippa listing is likely to increase the sale price of your website by $630. Interestingly uploading Google Analytics PDFs of your traffic has little or no effect on a listing’s sale price. While I didn’t have sufficient data to study all of Flippa’s upgrades I did study their screenshot, bold, highlighted and premium upgrades. Each of the first three upgrades which cost $20, $5 and $10 respectively will likely increase the sale price of your listing by over $500. While the data is less clear whether using the three in combination will be as effective due to the large margin of error I can highly recommend using each of these Flippa upgrades for what will be an easy win. Very few people use the $250 premium website listing and as such the data is insufficient to render a concrete judgement, but nonetheless from the available data I would estimate that this upgrade will likely add between $6,500 and $10,000 to the sale price of a listing. These were probably to two most interesting areas in the study but I also analysed the importance of domains, what listing types do best and more. Mark Collier is the founder of DropMining.com, a soon to be launched start-up in the expiring domain space, offering premium data on 200,000 daily expiring domains. You can catch more of his data based posts on his blog.